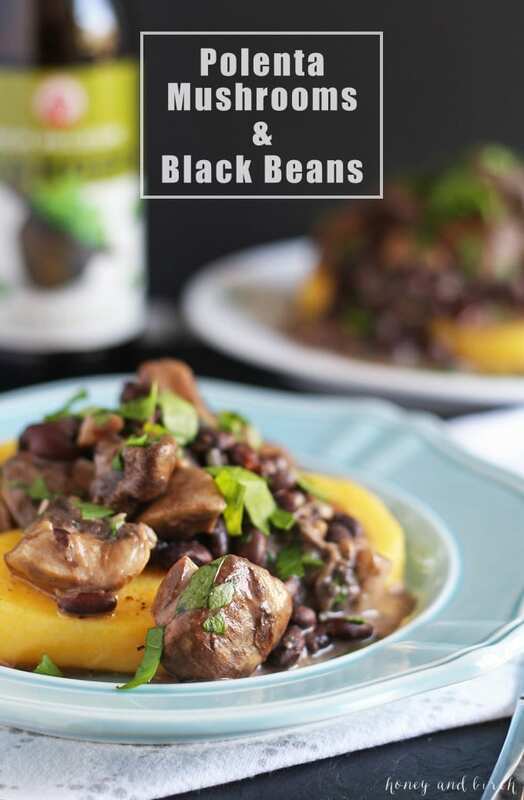 Polenta, mushrooms and black beans is easy to make and a delicious, savory vegetarian dinner. Perfect for meatless Mondays! 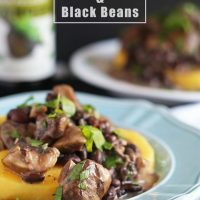 I am going outside of my comfort zone with this recipe for polenta mushrooms and black beans, and loving every bite of it. I was perusing Pinterest the other day, as most food bloggers are inclined to do, and I came across a polenta recipe from Cooking and Beer that totally inspired me. I had some polenta that need to be used so the timing was perfect. The polenta purchase itself was an impulse buy. I do that sometimes when I go grocery shopping hungry. That, by the way, is the worst idea ever. Never go grocery shopping when hungry. You will buy things like polenta without a purpose in mind. I plan out my meals and recipes for the week before I go shopping, so the polenta had to sit in the pantry until I figured out what to do with it. For starters we had mussels and a scotch egg. I don’t know if you remember the first time you had either of those, but I was half terrified. I was so worried of offending our host that I didn’t say I didn’t want either and struggled through it. Much to my surprise, I loved them both! I felt a little daring after that and when the server come by to take our dinner orders, I ordered something else I had never heard eaten: polenta. When our dinners arrived, I didn’t even know what mine was going to look like and almost told the server he had put the wrong plate down. Don’t forget this was years ago. I’m not even sure you could get the Internet on your phone easily back then. If this happened today, I would probably slyly look up anything I didn’t know on my iPhone. Anyway, I took one bite of the polenta, which was covered in tomatoes, and fell in love. I was a big puddle of polenta-loving mess. I ended up leaving so full that I was tempted to jump in a cab and just go home instead of going to the the performance. Mr. B was kind of in the same boat as me when I started cooking this. He knows I’m not going to ask him to try anything weird but when he heard “polenta, mushrooms and black beans,” he was concerned. He took his first cautious bite … and devoured the rest of the plate. Just to be safe, and to make sure this recipe was a winner, I had my neighbor come over and try some too. He also liked it. The polenta I used was purchased at Whole Foods and I followed the package directions for cooking it in the oven. If you are making polenta from scratch, replace the polenta part with your recipe’s instructions. If you have a little extra goat cheese, sprinkle it on top as a garnish – a little extra goat cheese never hurt anyone. Preheat oven to 350 degrees. Using 1 tablespoon olive oil, brush both sides of the polenta rounds and place them in a baking dish or on a cookie sheet. Cook for 20 minutes in the preheated oven. In a large pan, heat the remaining 2 tablespoons olive oil over medium heat. Add the garlic and sauté for 1 minute. Then add the mushrooms. Sauté for 6-8 minutes, or until the mushrooms are tender. Stir occasionally. 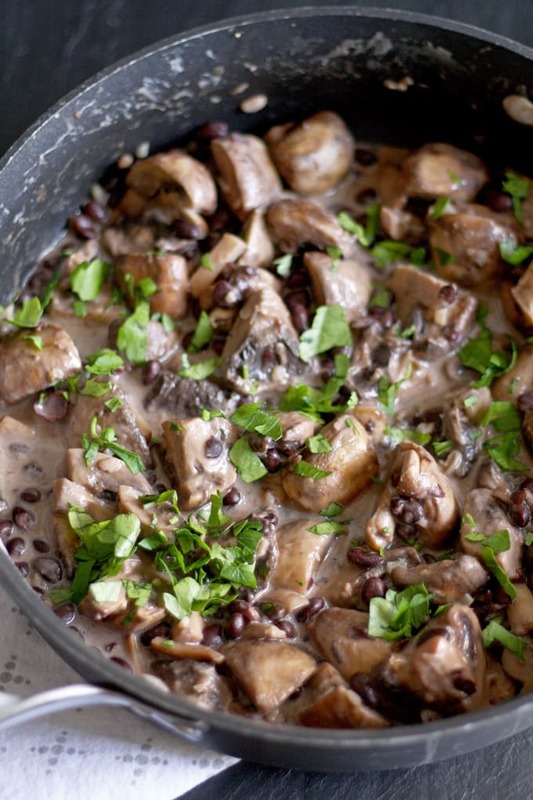 Add the black beans, beer and goat cheese to the mushrooms. Stir well and increase heat to medium high. Cook for an additional 10 minutes. Add the minced parsley, stir and remove from heat. Remove polenta from the oven. 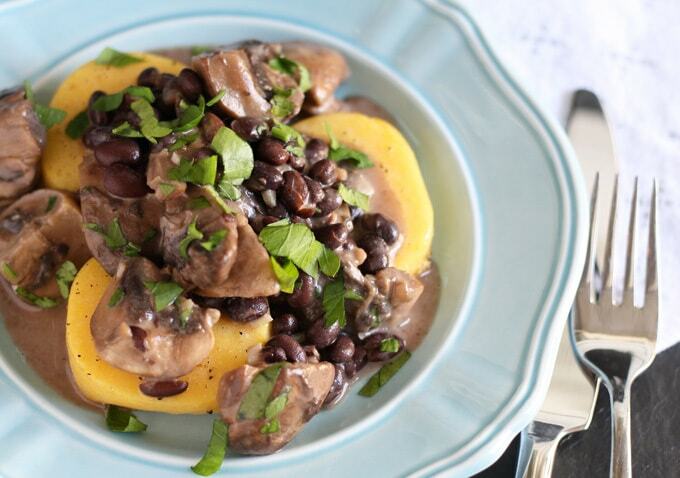 Place 3 polenta rounds on a plate, and spoon the mushroom/black bean mixture over the polenta. Serves 4. Inspired by Cooking with Beer. Looking for more vegetarian dishes? My black bean enchilada recipe is another great dinner and my hummus veggie sandwich is perfect for lunch! Can I just come to your house and eat and drink? :-)Your recipe looks delicious and the tea you shared would be such a great treat! Thanks again for sharing at the Thursday Favorite Things Blog Hop! I was just talking about polenta with my sister this weekend,,, mostly about how I’ve never had it. This looks like an amazing recipe to start with, now I’ll have to try it! I love this as an idea for Meatless Monday – sounds delicious! I’m totally hit or miss w polenta. IMHO it’s all about the toppings that make polenta shine. Love this recipe. Saving & sharing. Thank you so much Gwen!! I feel like its hard to get the flavors right with polenta sometimes, so I can totally relate. I absolutely love polenta, this sounds like a wonderful preparation! Thanks for sharing at What’d You Do This Weekend? !